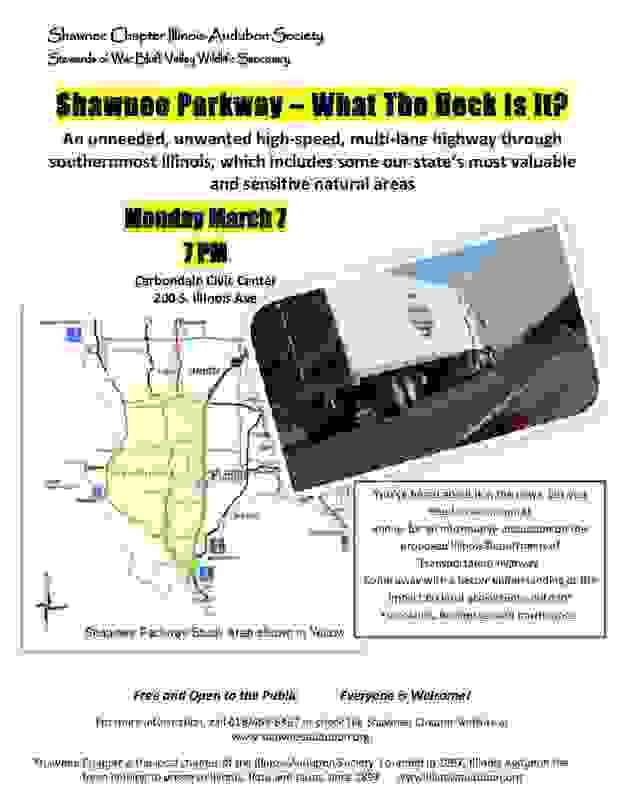 Shawnee Parkway – What The Heck Is It? Or join us at the meeting on Monday March 7th in Carbondale IL. Shawnee Parkway Project–a new name for an OLD proposal! Citizens of southernmost Illinois have been fighting against the Illinois Department of Transportation’s proposal for a unneeded, unwanted high-speed, multi-lane highway through southernmost Illinois, which includes some our states most valuable and sensitive natural areas. IDOT is calling the current version of this proposal the Shawnee Parkway Project. This time, rather than proposing an extension of Interstate 66 that would traverse the state from Paducah, Kentucky to Cape Girardeau, Missouri, IDOT is now proposing a highway that connects Rte 3 to Interstate 57. This is the tactic the Federal Highway Administration has used to build every segment of I-66. If the Shawnee Parkway were to be permitted and funded, it would only be a matter of time before the agencies return once again with plans to connect I-57 to I-24 in attempt to connect to I-66 in Kentucky. The Citizens for Southernmost Illinois (CSI) have serious concerns with the purpose, planning and development of the “Shawnee Parkway.” The negative impacts simply outweigh any questionable benefits for the people who live and recreate here. We can’t afford to gamble away our remaining economic and natural resources. 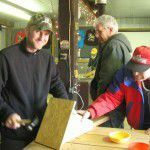 CSI is dedicated to promoting and protecting our rural lifestyle and the rich natural environment that is part of our home and livelihood. Between the incompatibility with outdoor recreation, loss of tourism, the drain on the local economy, loss of private land and the huge amount of government financial waste, the impacts of this project are simply too many and too much. Shawnee Chapter is opposed to the proposed Shawnee Parkway, and is sponsoring this informative meeting in order to help the public understand the issues, and learn how to get involved. This entry was posted in Presentations and tagged local ecosystems, outdoor recreation, presentation, preserve natural areas. Bookmark the permalink.